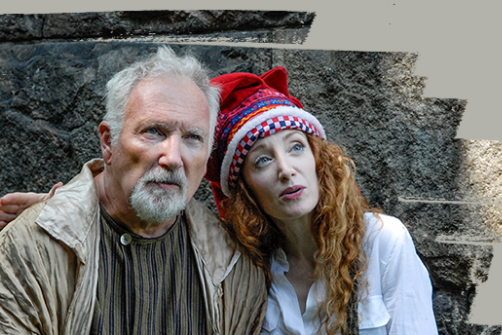 Mark Peters and Judy Krause in The Fool's Lear. BOTTOM LINE: A clunky retelling of Shakespeare's King Lear, exploring the traditional master and servant relationship. Any retelling of a Shakespeare play is a tall order. Doing it with just a few actors and four chairs in about two hours makes it more difficult, but it can be done! The Fool's Lear at IRT Theater takes a valiant stab at updating this classic in a timeless manner, making the story accessible for all. The Fool’s Lear is an abridged version of King Lear, adapted and directed by H. Clark Kee. When Lear (Mark Peters) decides he has become too old to rule, he steps down and divides his kingdom between his three daughters, Goneril (Elizabeth A. Bell), Regan (Virginia Armitage), and Cordelia (Annie Winneg). To receive their portion, each daughter has to tell their father how much they love him. While Regan and Goneril flatter, Cordelia refuses to speak on the matter and is immediately banished. Kent (Joe Penczak), the king’s loyal nobleman, tries to intercede on Cordelia's behalf and is banished as well. Tragedy ensues, as Goneril and Regan let power overcome them. Meanwhile, Gloucester (Robert G. McKay), another member of Lear's court, is having his own family trouble, with his illegitimate son Edmund working to convince him that his legitimate son Edgar is trying to kill him. Both fathers are betrayed by their children, leading ultimately to the destruction of both the kingdom and the two families. Advertised as a retelling of King Lear with emphasis on his relationship with the Fool (judy Krause), this production nevertheless follows the classic text entirely, with the Fool not speaking until roughly 25 minutes into the play. While some actors handle the text with nuance, grace, and ease, others fall flat. Penczak and Krause shine as Kent and the Fool respectively; scenes where they are able to play off each other are engaging and witty. Peters’ Lear is hard to engage with at first, but his journey becomes especially poignant toward the end of the piece. McKay’s Gloucester commands the stage with a moving voice, and though she is only seen for a few short moments at the beginning and end of the story, Winneg is a brilliant Cordelia, honest and full of conviction. The rest of the cast falls short of these masters at work, though a few moments with minor characters bring a laugh. Dealing with a very intimate space and limited scenic pieces, Elizabeth M. Stewart’s lighting design is quite impressive, shaping the actors with finesse. However, the use of a wheelchair for Lear both diminishes his performance in stature and nuance while creating confusion about the time period and style of the piece. Similarly, the costume design is full of beautiful fabrics, albeit simple and lacking specificity. I fully understand the intention to have the kingdom feel grander than the four walls of IRT's black box, but the use of a projector is unwarranted, as is some of the uninspiring sound design. The Fool's Lear lacks the finesse and full command of language that Shakespeare requires, but outstanding performances from Penczak, Krause, and McKay could make the evening worth your while. There is enough potential in the text to carry us on a magnificent journey, but the disjointed cutting and clunky staging may make you feel like you’re the one descending into madness. The Fool’s Lear is adapted from Shakespeare’s original text and directed by H. Clark Lee. Lighting Design by Elizabeth M. Stewart. Sound Design by Ostinato Productions. Production Stage Manager is Charles C. Casano. The cast is Virginia Armitage, Elisabeth A. Bell, Sean Demers, Brian Heuer, Judy Krause, Robert McKay, Joe Penczak, Mark Peters, Ross Pivec, Fariaz Rabbani, Mike Roche, and Annie Winneg.